I dispute the stylized fact. I am peripherally involved with (well, hearing about) a U.N. survey design in Port-au-Prince: the lawlessness is out of control. Kidnappings, assaults, and rapes are endemic. Concepción, on the other hand, has a looted shopping center. These are not the same thing! Haiti seems orderly because expectations were much worse. Chile seems chaotic because expectations ... well, actually, Chile doesn’t seem that chaotic, given the scale of the disaster. More chaotic than it needed to be, but the state functions and there has been no organized violence. Minute-to-minute reports here. Yes. Context-dependence. By any absolute standard, Haitians reacted far more violently than Chileans to the earthquake, because the destruction was far greater and the state basically collapsed, even if it is now getting back on its feet. Apples and oranges, context-dependence. I have many reasons to like Chile to the point of taking out dual citizenship. Democratic government, great climate, good music, nice roads, and a flag that reminds me of what is still my favorite country on the planet. (You know, the one that got the silver in men’s and women’s hockey.) And to all that you can add a sensible response to looting after a natural disaster. The issue he raised is a real one, but Chile should not be impugned, when in fact the government is responding with alacrity and good sense. ¡Felicidades! ¡Viva Chile! Take it back, Matt! Chile awaits an apology. I’ve checked, and everyone I know in Santiago seems to be all right. The earthquake has been incredibly severe, but the state is responding. Then again, there is economic recovery and there is death and destruction. These are very different. So even if it is the case that richer nations take longer to recover from natural disasters, far fewer of their citizens are likely to die. Moreover, citizens of functioning democracies are also more likely to make it through, even after adjusting for income. Chile is both relatively rich and a functioning democracy. Today is a nightmare; but nothing along the lines of what is going on in Haiti. American Airlines, I should say, is running flights for relief workers out of both Miami and Fort Lauderdale. Kudos. This was one of the most useful signs I've ever spotted while driving along a rural highway. I temporarily moved to Santiago in late 1991. For the first few months, I had a room in a house owned by an elderly couple way out in upscale suburb called Las Condes, beyond the end of the metro. (There were only two metro lines.) Back then, it was a neighborhood of single and double-family homes. Apoquindo Avenue was essentially a suburban strip, densely built-up by American standards, with the occasional high-rise and pedestrian-friendly sidewalks, but a suburban strip nonetheless. I wouldn't've recognized the neighborhood (since I couldn't remember the name of the damned cross-street to save my life) if it hadn't been for the minor miracle that the Pizza Hut on the corner of Apoquindo and Capitanía was still there. But I remembered the house was on Nevería, a block from the street that hit Apoquindo at the Pizza Hut, and with the cross-street I could locate it. So I went looking. And what did I find? Big apartment buildings! Could that kind of change happen in America? I have my doubts. In my last post, I briefly discussed the high cost of American zoning laws. Such laws prevent wholescale changes in land use, causing cities to sprawl more than they would have otherwise. In other words, they lock in the existing pattern of land use, preventing the kind of wholescale change that in past decades gave us such delights as the boulevards of Queens and Wilshire, where high-rise corridors sprouted along formerly suburban strips. Today, I don't know if that happens at all, with the exception of a few downtown districts. When densification pressure starts in an American neighborhood characterized by single-family homes, zoning changes usually squash it, the way New York City has moved to protect the pristine environment of Queens from an onslaught of apartments. Let alone, say, the Bay Area. Imagine Palo Alto filled with high-rises and three times the population. And no, Houston is not an exception. ¡Domingo flojo! Despierta tarde en el mediodía, llama al tren, pa’ver q pasaría ... Narnia? No no no no no. So I line up a trip to the deep-pit copper mine. Chido! At which it point it starts to hail around here, and the company cancels. (Liability issues. Chile is not Mexico, it seems.) So I figure, hey, Chile has restarted passenger train service, why not chill in Chillán? Metro to the train station, thin attractive woman a little older than me and wearing this cute little neo-hippy snoopy hat sells me a ticket with just the right amount small talk to remind me why I like this country so much. Only ... she realizes that the return trips are all sold out. I debate taking the bus back, decide no, and now regret it. WTF am I going to do in Santiago on a rainy lazy Sunday? Work in my hotel room? Too depressing! I'll figure something out. Meanwhile, Doug Muir is in Senegal, with details here and here. I, of course, am fascinated by the French influence. As always, don't expect pictures from Mr. Muir, but do expect lots of information, historical detail, and very good analysis about what it all means. You can also go here and here on this blog, where we discuss another part of the French not-empire in West Africa, or here, where you find out how Burundi got a handle on infectious disease. I'll be back with more about regional inequality, copper, and the effect of the Panama Canal on Chile, but right now I'm going to go brave the rain and wander aimlessly around Santiago for a while. I will, however, take requests for any Chile-related topics you might want to know more about. (Randy has one pending on regional inequality.) Hasta pronto, mis cuates desconocidos. In 1991, when I was last in Chile, the military was a thing apart. Its rule over the country had only ended three years before. The Constitution of 1980 reserved it a special role. There was an organization called the National Security Council that consisted of the president, the heads of the Senate and Supreme Court, and the commanders of the four branches of the military. The NSC could determine its own decision-making functions. It selected four out of 36 senators, not including the seat reserved for Augusto Pinochet. It picked two out of seven members of the Supreme Court. The president couldn't remove military commanders without its approval. If it saw “the menace of war,” it could order the central bank to extend credits to any person or group that it saw fit. In addition, albeit not part of the constitution, a 1954 law granted the military 10 percent of Codelco’s copper revenues. It was all very undemocratic, save for one thing: the armed forces relied on conscription, and had since 1900. The annual take, however, was never more than 20 percent. In effect, it was fairly random and easily avoided, which undercut any chance that the military might become a citizen army. Most of that has now changed. The NSC is now just an advisory board, and the non-elected senators are a thing of the past. The military continues to get its share of Codelco revenues, but tensions with the neighbors are very low, and civilians set policy. And ... perhaps inevitably ... conscription has ... well ... not quite ended ... it’s weird, and it raises a lot of interesting questions for the United States and elsewhere. 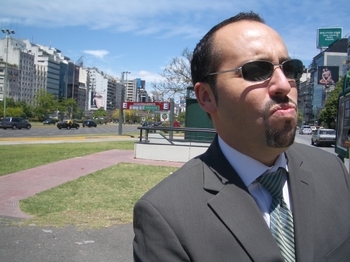 The last time I was in Santiago de Chile was in 1991. It was a bad year. The First Gulf War ended in February. The U.S. economy was in the toilet. Unable to afford school fees, saddled with a large short-term debt dumped on me due to a bit of ... ah ... creative financing by a ... hmm ... unrelated family member, and needing to save to pay for my long-anticipated trip to South America, I stopped out of school and wound up doing odd jobs that paid enough to keep me sleeping in my car. Which was a 1980 Plymouth Champ. If Marcia still comes here, she can probably say more about this period than I remember. Or necessarily want to. The data show that Chile had an economy about half as productive as the United States at the middle of the last century. Chile more-or-less maintained that ratio until the economic collapse that hit at the tail end of the Allende presidency and the first few years of the Pinochet dictatorship. There was a rapid recovery afterwards, but the economy went right into another tailspin in 1982. The solid growth rates since then have only taken the country back up to the same relative position that it held at the end of World War 2. That said, the place is lot richer than it was when I was there in 1991. Your average Chilean worker produces more than half again as much as he or she produced back then. But what does that mean on the ground? ... shows the number of private automobiles per 1,000 people for various countries around the time that they reached the same level of auto penetration that Chile enjoyed in 1991. That would be Italy in 1960, France in 1952, Britain in 1951, and Argentina in 1968. All saw their car ownership grow more quickly thereafter than Chile. There is some reason to believe that Chilean income inequality has widened. Since 1993, average wages have risen 40 percent, in line with labor productivity growth of 42 percent. That said, the real wages of high-level managers have risen 58 percent, while those of unskilled laborers have risen by 36 percent. Personal service workers — e.g., maids and security guards — have seen their real wages rise only 29 percent, and skilled machine operators wages have gone up just 25 percent. I'll put up more sporadically, as I look into the economic and social situation of the country I'm going to revisit soon. Is there anything in particular that anyone out there is curious about? Angry Argentine commuters in the B.A. 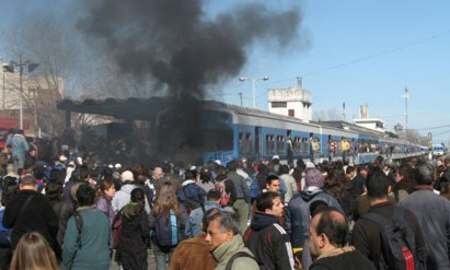 suburbs of Merlo and Morón burned trains and occupied the tracks yesterday. They got angry when a train conked out right in front of them. The good thing? This incident might finally kill the Tren Bala. 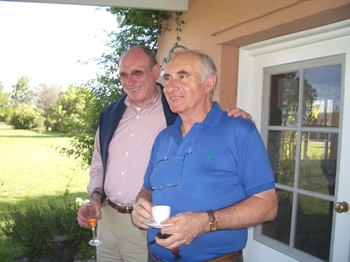 The mayor of Buenos Aires, Mauricio Macri, has now come out in clear opposition, as did a congressperson allied with President Fernández, Martín Sabbatella. “It remains clear that this country’s priority cannot be the Tren Bala.” Better still, the head of a major trade union also allied with the President, Hugo Yasky, also came out against the project, calling instead for more investment in the collapsing commuter rail system. But not all Argentine megaprojects are dead. The day before the riots in Castelar and Merlo, President Fernández declared her support for a 13-mile train tunnel through the Andes to Chile, at an estimated cost of US$3 billion. Unlike the Tren Bala, a cargo link between Chile and Argentina is an excellent idea. Most of the financing will be private, the current road link (which I've driven) is clearly inadequate, and the economic benefits are clear. It won't be as cool as a bullet train, but it will help generate jobs and raise incomes. 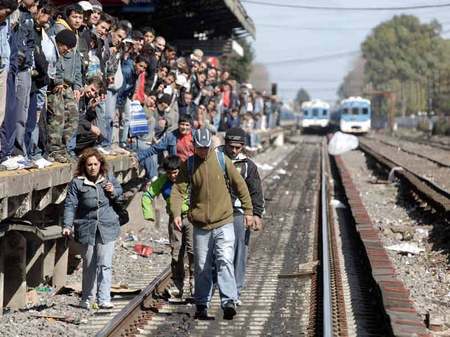 Plus, the Buenos Aires rail system desperately needs to be fixed. Upgrading commuter rail isn't a marginal wouldn't-it-be-nice project, the way it would be in New York or the Netherlands. Rather, upgrading commuter rail is something absolutely necessary if Buenos Aires is to remain a functioning metropolis in the future. So while I don't generally approve of burning public property, sacking offices, or overturning cars, this particular angry outburst may have done the country some good.